What does "full employment" mean in the era of anchored inflation expectations? 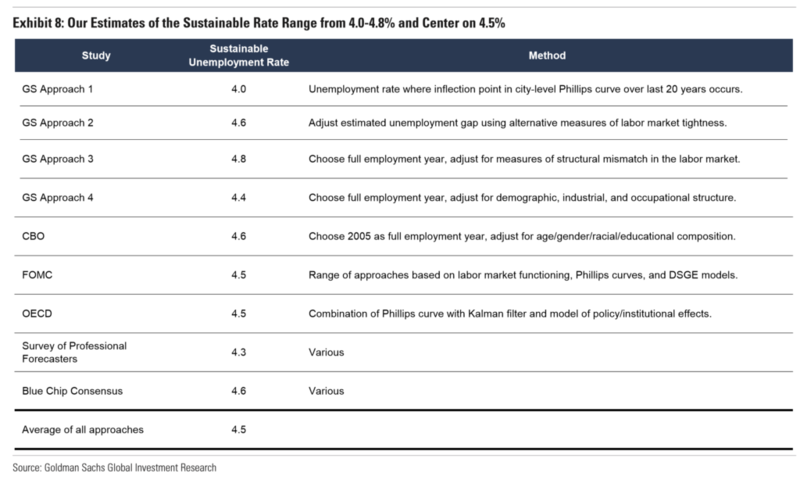 There's a new analysis out by a group of economists from the Goldman Sachs economic research team that raises the question of what the concept of full employment means in an era when the central bank extends significant and successful efforts to anchor inflationary expectations. The paper (which lives behind a paywall) uses four distinct techniques to to derive different estimates of the natural rate of unemployment, aka u*, aka the lowest unemployment rate consistent with stable inflation. The results range from 4 to 4.8 percent, which, as their figure below shows, fit well within other commonly sourced versions, including CBO (4.6 percent) and the Fed (4.5 percent). Note also their forecast for the jobless rate to get to 3 percent (!) by the end of next year. As they say in the old country: "from their lips to Keynes' ears." "The actual unemployment rate is already below all of these estimates, and we expect it to fall all the way to 3% in early 2020. But…such a scenario is not as dramatic as it sounds: with well-anchored inﬂation expectations, a labor market overshoot is likely to result in above-target inﬂation, but not persistently accelerating inﬂation. This is an important difference with the late 1960s, when labor market overheating led to runaway inﬂation." Now, one of my constant refrains these days is that the Fed's 2 percent is an average target, not a ceiling. Given the many years of downside misses on the inflation target, we're long overdue for a period of "above-target inflation." So, if these analysts are correct, as I suspect they are, then this overshoot is a feature, not a bug. If that's true—if an unemployment rate significantly below the Fed's natural rate estimate means we get something we very much want (super tight labor markets) as opposed to something we very much do not (spiraling inflation)—then, conditional on inflationary expectations remaining well-anchored, being above full employment is precisely where we should aspire to be. This is an awfully different economic model. 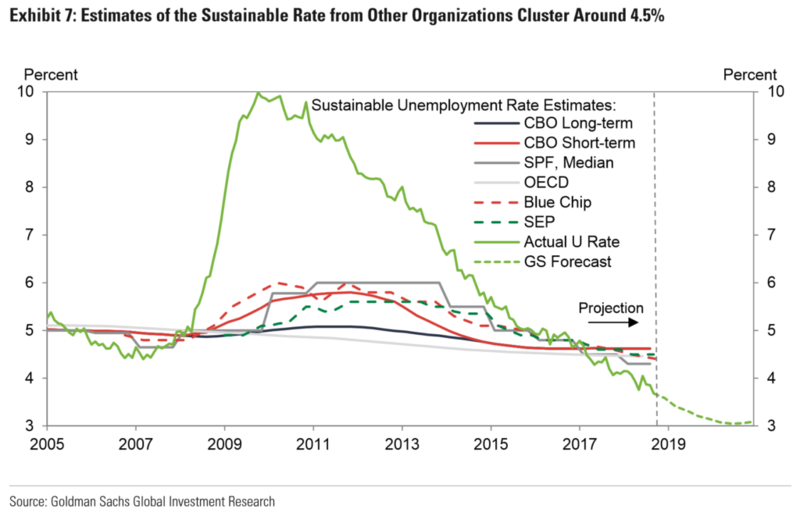 In this model, go ahead and bang out estimates of the natural rate if you must, but recognize that (u-u*)<0 (actual unemployment below your estimate) is not a signal to hit the growth brakes. In this model, your real job is to watch the indicators of inflation expectations and realizations. And if, as is currently the case, they seem well-contained, then there's no reason to overreact. One interesting aspect of this conclusion is that those of us who have criticized the Fed's anchoring as being a drag on demand relative to more flexible inflation or level targeting (I'm talking to you, Beckworth) might consider that at least under this framework, solid anchoring enables stronger demand and lower unemployment than would otherwise prevail. However, for those who benefit the most from such low unemployment to realize such gains, the members of the FOMC would have to recognize these dynamics. I actually think Chair Powell does, and he's not alone, but there are others who look at that 3 percent at the end of the figure above and think, "not on my watch!"